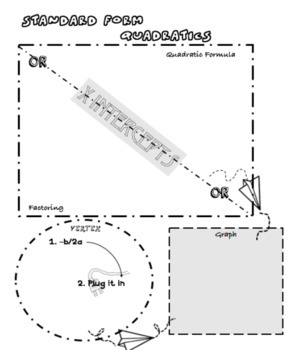 Included are 9 note sheets for the 3 forms of quadratics. 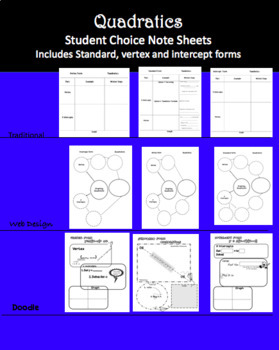 The note sheets have 3 different versions for each form (Standard, vertex and intercept) so that students can choose the appropriate note sheet for them. 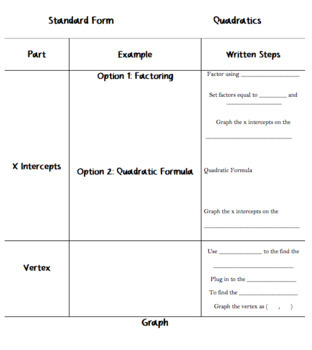 Option 1 is the traditional Cornell note style. Option 2 is the web design and option 3 is the doodle note style. Each note sheet incorporates the same information for easy classroom use. 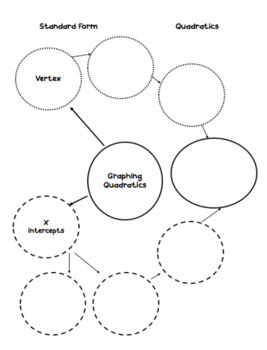 An example of each is included in this package. The examples are not as pretty and colorful as my students create but provides a starting point for how you could use these in your classroom.